Derrick has been making this style of ring since 2009. The shank is particularly wide in front, then dramatically tapers to a much narrower width in back. Beautifully stamped and decorated with appliqueés, an oxidizing agent was used on this to develop tarnish in the stampwork to heighten the contrast between the stamped motifs and the smooth polished surfaces. 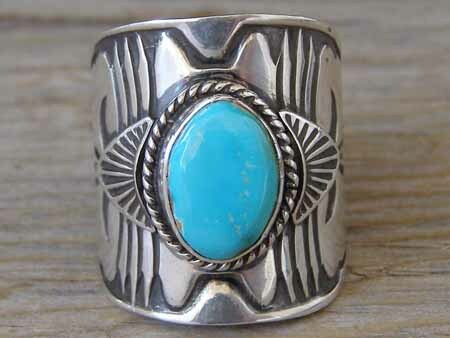 This is set with a pretty blue stone of natural, untreated Royston turquoise from Nevada.